Is OSHA falling down on the job? The American workplace is far safer today than it was four decades ago, but nonetheless a dozen workers die every day from job-related injuries. 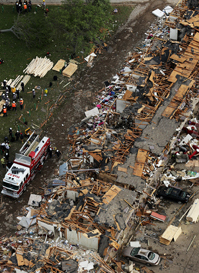 A catastrophic workplace accident occurred in April, when a West, Texas, fertilizer plant exploded, killing 15 people and obliterating much of the town. Worker safety remains controversial, with labor advocates complaining that antiregulatory sentiment has hobbled the Occupational Safety and Health Administration's ability to regulate workplace hazards. But business groups argue that many OSHA rules are ineffective and hurt productivity and profits. Meanwhile, emerging technologies such as nanotechnology and synthetic biology pose new challenges to regulators, while age-old workplace problems like trench cave-ins and musculoskeletal pain are still widespread. Overseas, deadly industrial disasters at factories producing clothing for the U.S. and European markets have raised questions about the ethical responsibility of companies that outsource jobs to developing countries with lax worker protections.